Josh Fox has made another attempt to rescue his imploding reputation by releasing another short movie but FrackNation and the facts show it’s a new GasHoax. When Josh Fox imploded on Stuart Varney’s FOX News program a few months ago, it signaled the rapidly approaching end of his con game. Now the charlatan is attempting to resurrect a boom and bust career by attacking from another angle, suggesting he’s only interested in the health of gas workers. He calls the new short movie Gasworks. It’s another collection of distortions and half-truths apparently intended to drive a wedge between gas companies and their workers (some of the happiest and most loyal I’ve ever see) and recreate the specter of danger his fraudulent flaming faucet offered to naive viewers. As both Phelim McAleer of FrackNation and the good folks at Energy In Depth show us, though, it’s just another GasHoax by the biggest huckster of them all – Josh Fox. 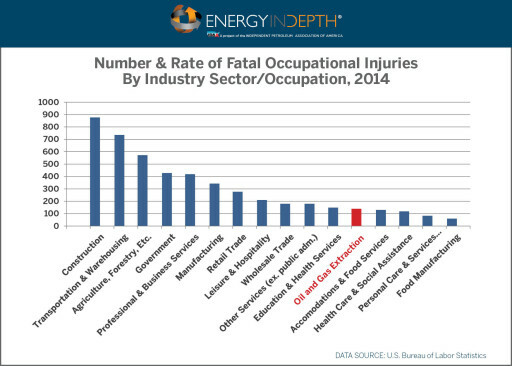 The Bureau of Labor Statistics’ (BLS) data show that construction, transportation and warehousing, agriculture, forestry, government, professional and business services, manufacturing, retail trade, leisure and hospitality, wholesale trade, and education and health services had more fatal injuries than the oil and gas industry in 2014. [While] BLS has not yet published its 2014 data for nonfatal injuries and illnesses… its latest data show that injuries significantly declined by 15 percent from 2012 to 2013. BLS finds the incidence rate for oil and gas is 1.3 per 100 full-time workers, which is less than half the national rate of 3.5 per 100 full-time workers across all industries and government. Again, industries like fishing, bartending, and taxi and limo drivers had far higher injury rates. 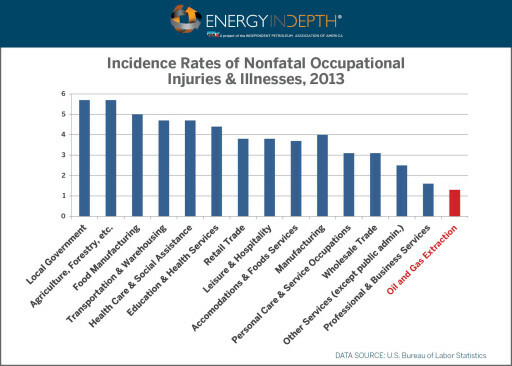 Further, from 2011 to 2012, the injury rate for oil and gas fell 33 percent. The latest BLS data show that oil and gas related fatalities in 2014 declined in some of our most prolific energy producing states. BLS statewide data aren’t yet available for oil and gas production specifically, but its data for overall fatalities in all industries within the state have been published, and that data show that North Dakota saw a 32 percent decrease, California saw a 16 percent decrease, and Pennsylvania saw a four percent decrease in fatalities.The 32 percent decrease in North Dakota happened while the average daily rig count jumpedfrom 180 to 190 from 2013 to 2014 and the total number of wells increased from 11,942 to 12,439 over the same period. North Dakota had a 26.47 percent increase in crude oil production from 2013 to 2014, and the state is also our second largest oil producer behind Texas. Further, the other two states that saw reductions are also among the most prolific oil and gas states: California is our third largest oil producer while Pennsylvania is the second largest natural gas producer. Congratulations to both Katie and Phelim for exposing, yet again, Josh Fox’s cheap propaganda for just what it is. The only thing they left out of the story is the funding of this latest Fox endeavor. Is this the Gasland Part 3 project the elitist Park Foundation has funded Fox to produce (see grant descriptions from their website below)? One suspects so, but it could also be tobacco money, Soros money, Debra Winger money or National Endowment for the Arts or New York State Council on the Arts money. It could even be Rockefeller money (go here for list of “partners” in his Grassroots Solutions project). Who knows – the guy is good at conning money out of all these folks. One thing we do know is that there’s nothing grassroots about anything Josh Fox does. He’s the court jester for the gentry class. He might want to consider what happens to court jesters (known as “fools”) once the King or Queen grows tired of them, though, because he’s getting very tiring these days. You’re very predictable, Michael, as I knew, when writing that phrase, that you would pick up on it and comment – you’ve a great editor’s eye. Anyway, it’s not as bust as you think. Come to the shale fields and I’ll give you a tour and show you (seriously). We’d have a great day arguing and you’d get to see reality and what to looks like on the other side of the Jersey City skyline, out where we don’t “wear our hair long and shaggy like the hippies do” and our elected leaders don’t honor Soviet spies with resolutions. Tom tell him the truth about HVHF and how it is an unsafe industrial process being done next to people’s homes .See I am from the area you mentioned and got to see up front what really goes on .So tell it like it really is ,not just all the good (limited ) stuff…! You never anything new to say, Bill, just blather and more blather. Because when I experience something that is hazardous to people like (HVHF ) I believe in trying to stop or limit it’s existence (or get more reg’s ) .Not redundant just persistent for many reasons !If I felt there was no concern I would have nothing to comment about Pretty simple approach called honesty and truthfulness !! something not seen much in today ‘s world . …. Fox’s website says that “the fatality rate of oil field jobs is seven times greater than the national average”. This is obviously different from your stat, so giving both sides the benefit of the doubt, what accounts for the difference? Does the BLS stat include ALL O+G industry workers, while Fox’s includes only those working on fracking well pads? Seems to me we should stop fishing and farming while we are at it. But you left out the part where that number lumps mining and quarrying into oil and gas. No doubt that is what is swelling that rate; just as I’m sure hunting alone swells the rate of the groups that it’s lumped together with. does a good job separating the industries, and I bet if you lumped in renewables with the O+G industry it may increase that already misleading number. In oil refining, the injury and illness rate was 1.1 per 100 full-time workers versus 4.4 per 100 for the U.S. manufacturing sector overall. Well, you answered your own question from the comment above – Fox grossly exaggerated the numbers. However, you should also take note the 14.1 covers mining and quarrying as well as oil and gas and three charts later in your link you’ll notice the latter accounted for an average of 68% of the fatalities over the 11 year period. Also, the data on the charts is very misleading as there were only 18 oil & gas fatalities in 2014, as you can learn from the data finder at BLS, not the 142 suggested. There were only 12 in 2013. I haven’t dug deep enough yet to understand what that disparity exists (I suspect the charted data includes related occupations) but using the lower figures and comparing them to the number of employees in that same NAICS code for 2013 (latest available) I come up with a rate of 9.1 to 13.7, which suggests oil and gas also has less fatalities per 100,000 employees than transportation and warehousing, for example, which has five times as many fatalities overall. I bet that the workers in the O&G industry would rather have their good-paying jobs than to have Josh Faux – in his all-knowing benevolent liberal nanny state attitude – take those jobs away, as he’s tried to do. None of those workers ever though about how much hazards they were creating near people’s homes ,so why should people care about them ?…….find another job ! I did it plenty of times . The issue of safety, whether for workers or in any other sphere for this industry or any other, is important which is why we have laws and regulations in this country. Like any issue it requires a balanced thorough look which it seems is very difficult to get in this moment when it comes to this industry. It’s difficult to see how Mr. Fox might be able to produce a report that is balanced or even accurate at this point considering that his goal is to shut down this industry not to cover an issue as a real reporter might. Below is a recent quote from his social media site where he communicates exactly the opposite of the purpose of a currently proposed LNG import project which if permitted will deliver imported natural gas supplies to Long island. GASLAND shared Sane Energy Project’s photo. That is a problem and it is a result of the extremely insular network of activists that are the antifracking movement. Advocates or activists on either side cannot be the tellers of the story and there is a real problem with what is being communicated to the public by the anti-side which includes pipeline permitting process, safety, emissions and many other things. This is something that the press should be covering. Bill, “industrialization” did not come into being in the last couple of years. Nor did worker safety issues, emissions, pollution, environmental impact or regulations regarding these things. Nor did natural gas development. Nor did pipelines and the permitting process they require, NEPA and lots of other things. Also the concept that someone with an agenda, whatever it might be, may not be the best choice for who you would like to get your news from or all your news on a topic from is also not new. The ability of citizens to get valid factual information on thetopic of natural gas development, trasnportation and use has been severely compromised and here is my opinion from experience with the topic: it is the activists who are the problem. I did not come to that opinion lightly, without research and it was a surprise and disappointment to me. Well Karen …my comments come from what I have experienced around me in the last 5 + yrs.Not from articles or industry or groups ,but actual visual experience of operations and people affected by the drilling .I really don’t care how long industry has been in existence ,I do care about how close ,unsafe,and toxic it is when it is allowed in an non industrial zone next to my and others homes ….pretty easy approach !!! Just report about what really occurred ! Let’s be absolutely clear on this. Josh Fox has produced three movies about the evils of hydraulic fracturing (note as well that he has never participated in a frac nor has he reached out to the industry for a working tour of a hydraulic fracturing job in progress). His goal has been to shut down an entire industry because of his misguided and unfounded perceived ills for nearly a decade. Enter yet another ‘movie’ by Josh Fox entitled, Gaswork, where he is now suddenly concerned about the safety of the very workers he has been maligning for years. This disingenuous effort by an obviously disingenuous filmmaker is another pathetic attempt at a limelight that is fading quickly given how his last three documentaries have been shown to contain massive errors, inconsistencies and downright falsehoods. Josh Fox is not saying, “We need to demand better safety for these workers” he is saying, “Safety will not be an issue if we just shut everything down”. This is the same as saying that if we stop people from driving their cars, we will not have traffic fatalities. If the industry came to him today and said we have goals of reducing the safety risks for our workers because of what we saw in your film, these efforts would be completely ignored as this is not what motivated Josh Fox to make his films… any of them. Josh Fox couldn’t care less about worker safety. Josh Fox couldn’t care less about the safety aspects of the dozens of other industries which have a higher injury and fatality rates than oil and gas extraction. Logging, fishing, construction… every other industry is absolutely perfect in his eyes… except oil and gas. Josh Fox is a proponent of solar and wind energy sources, as well he should be, but would he be willing to turn his camera eye to places like Baotau China where half of the REM’s (Rare Earth Minerals) are extracted for renewable energy sources and produce a documentary on this impact to workers and citizens? Maybe to Josh Fox, it’s ‘out of sight, out of mind,’ and as he stated in a previous interview on another important subject, “it’s not relevant”. SO shut them down for good !! Never be Safe always be industrial with industrial issues …..
Hey Bill that just gave me a great idea! There,s big bucks in destroying american jobs! Dont give it away! NG workers don’t care about the people they harm so why should we care about their jobs ! !See I’m not sympathetic to those that screw me ! Just look at the data itself which shows that most definitely isn’t true. Moreover, quoting PowerSource is like quoting Josh Fox . No inconsistency there whatsoever, plus your own previous comment demolished Fox’s contention, which relies upon data for a period well before the shale boom hit full stride.